Alice Haeffner is the late wife of the former UCAS President Kyle Haeffner. 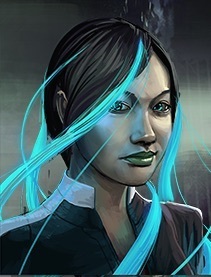 She was involved in the Echo Mirage project and died while fighting the Crash Virus of 2029. It is rumored that she is still “alive” in some way on the Matrix, and that she has a serious grudge against a certain Thomas Roxborough. These rumors also indicate that she has some sort of private host, called “Wonderland”. Occasionally, a Shadowland BBS poster by the handle “Alice” appears, and spurs on these rumors. As it turns out, she was helping TY, in order to get revenge on the Gilgamesh Initiative/Thomas Roxborough, with the assistance of the cyberzombie April O’Mally. Alice was keeping her going with an invoked memory stimulator, but eventually April gave up/gave out, and Alice allowed her personality to die, using techniques she learned from GI raids to keep the body alive, and inhabit it with her own persona. Alice/April is still on the warpath against the GI, though due to TY’s infection/betrayal, she is using other operators.